Almost every temple prepares puliyodharai/pulisadam/puliyogare as prasadams to pass around to devotees! I promise you with full assertion that the divine taste is always one of its kind that you will never ever get any-where and its a never ending pleasure that one will experience every time when visiting temples.The pulisadam made at home using the same recipe and procedure is always awesome and tasty but will not always equalize the temple-made because its made with all holyness and filled with all spirutual goodness that makes the prasadam(food offered to god)divine. But it’s not always possible to taste the temple made one,so we make it at the comfort our own kitchen and even with this puli sadam there are many variations that are made with their own style.Even at our home we make it differently, but I will share that recipe later this time its authentic puli sadam/puliogare/pulikachal is what Iam going to share! its flavourful temple styled pulisadam.The adding of roasted powdered mixture to the tamarind sauce makes all the difference the wonderful aroma is all hidden in this powder.The amount of tamarind extract can be reduced or increased according to their own taste bud preferences. 1.Take tamarind extract and keep ready. 2.Keep a kadai first dry roast urad and bengal gram dhal to golden,then jeera,pepper and coriander,then fenugreek and chillies separately at last add sesame fry and switch off and grind these to a powder keep ready. 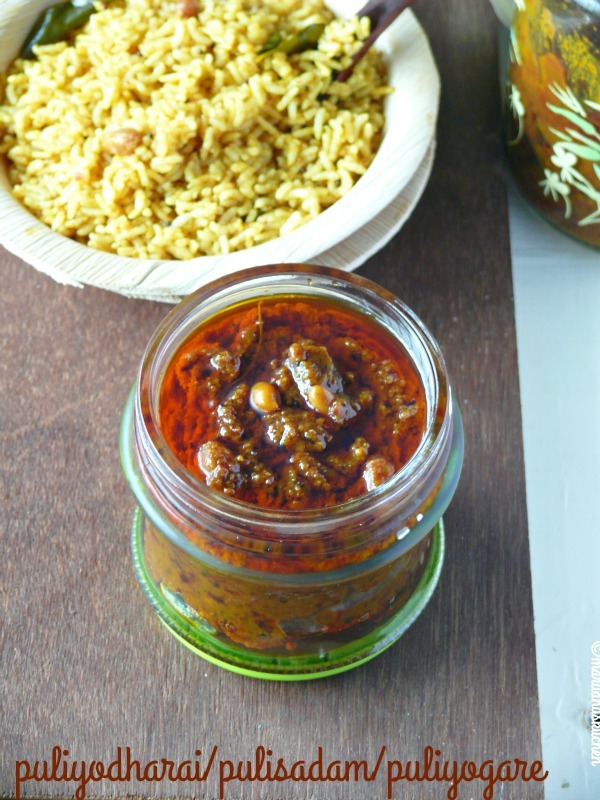 3.In the same kadai add oil and when it heats add mustard to crackle. 4.Add peanuts and then the curry leaves. 5.Add tamarind extract and add turmeric and hing powder to it. 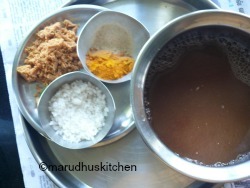 6.Then when it boils add salt and jaggery. 7.After few minutes add the powdered mixture to it. 8.Let it become thick till then stir in nicely. 9.All the oil will begin to ooze around the sides and then you can switch off the stove and store. Add few drops of gingelly oil to the boiled rice and mix when warm add the needed paste mix and serve. Take tamarind extract and keep ready. Keep a kadai first dry roast urad and bengal gram dhal to golden,then jeera,pepper and coriander,then fenugreek and chillies separately at last add sesame fry and switch off and grind these to a powder and keep ready. In the same kadai add oil and when it heats add mustard to crackle. Add peanuts and then the curry leaves. Add tamarind extract and add turmeric and hing powder to it. Then when it boils add salt and jaggery. After few minutes add the powdered mixture to it. Let it become thick till then stir in nicely. All the oil will begin to ooze around the sides and then you can switch off the stove and store. You can use raw peanuts to add it in the tempering but I have used roasted one. You can balance the tangy-ness according to your taste by adding less or more extract. If you wish your roasted peanuts to be crunchy add it at last. I have ground the red chillies and not added during seasoning if you wish you can add one or two. If you add needed oil only it will keep for long other wise it will spoil soon. Can keep for upto 3 weeks in fridge and outside for 10 days if stored in a sterilized clean containers. You can limit your chillies as per your spice level. True Vani your post is reminding me of the puliyogare they give as Prasadam at Tirupati temple. The bowl you have served it in is so similar. I agree it’s hard to replicate the temple taste at home. The dish looks too too good dear. The jar of pickle next to it is just mouthwatering. 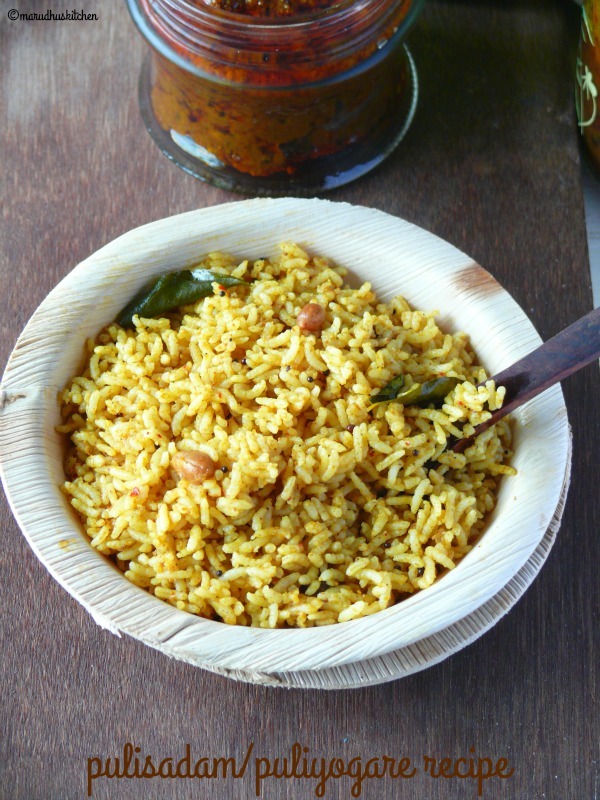 I haven’t yet made this tamarind rice.. It took me to dubai, where my friend use to make it in the afternoons after coming back from work.. I know the taste.. 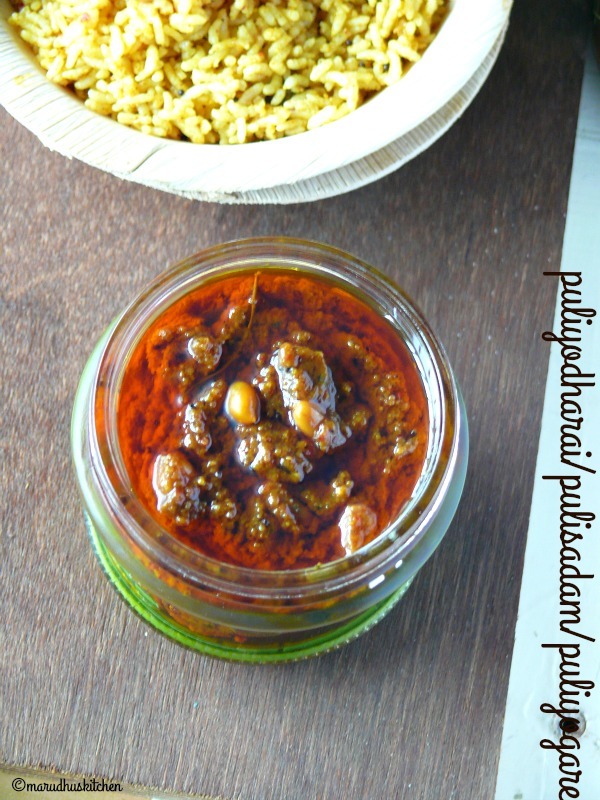 Your Tamarind rice looks so yummy..
just the mention of the divine tasting puliyodharai gets my mouth watering. simply irresistible in the ‘dhonne’ . love it! Delicious my favorite, you can send me one bottle so that I can make more often.